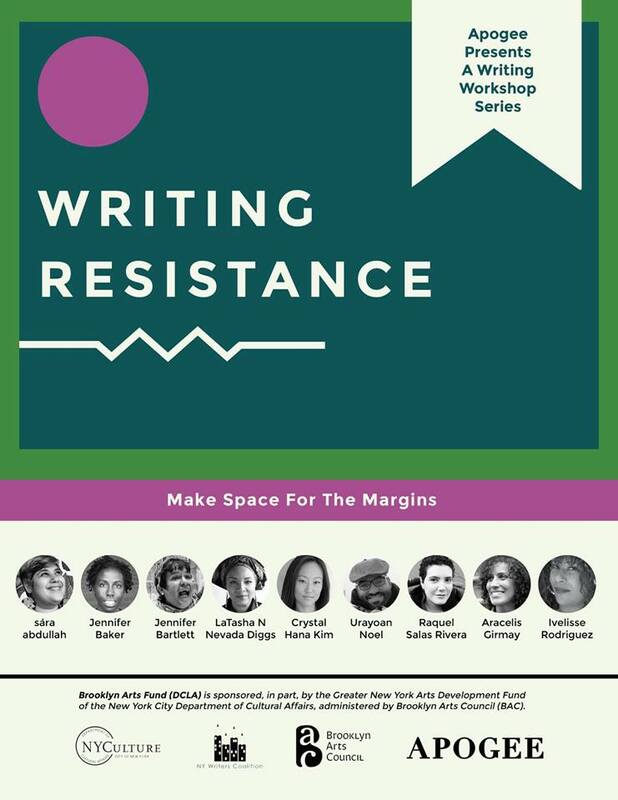 We’re partnering up with Apogee Journal, and with the generous support of the Brooklyn Arts Council, to bring you one digital and eight craft-based writing and editing workshops in our conference room at 80 Hanson Pl, Brooklyn: Writing Resistance 3.0: Make Space for the Margins. The workshops will be led by Apogee contributors and community members: sára abdullah, Jennifer Baker, Jennifer Bartlett, LaTasha N. Nevada Diggs, Crystal Hana Kim, Urayoán Noel, Raquel Salas Rivera, Aracelis Girmay, Ivelisse Rodriguez. Staying true to Apogee’s mission of creating accessible and socially-engaged programming, these workshops are affordable, inclusive and attentive to the ways identity informs reading and writing practices. *All classes will take place at our Conference Room in the 4th floor at 80 Hanson Pl, Brooklyn. Scholarships are still available, please email joey@apogeejournal.org or victoria@apogeejournal.org to apply.